Bernard Gavrin's family waited 70 years. 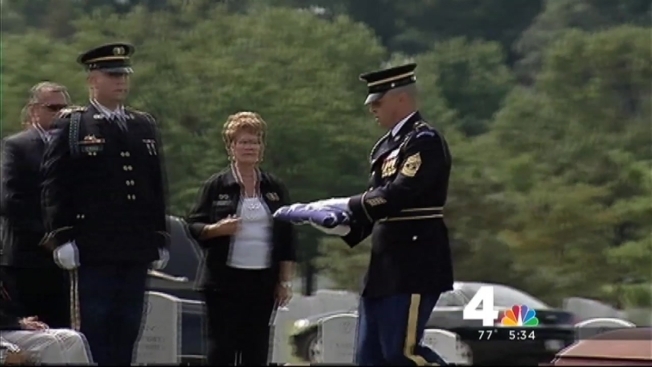 They thought the World War II soldier's remains had been lost forever. But Friday, they finally buried Gavrin, in the nation's most sacred ground for those who served in the military. Army Private first class Bernard Gavrin was declared missing in action in July 1944 after his regiment was attacked in the Battle of Saipan on the Mariana Islands in the Pacific Ocean. More than 3,400 U.S. soldiers were killed on Saipan, and many more Japanese died. Last year, a Japanese non-profit group recovered the remains of four American soldiers on the island -- and it DNA testing revealed that one of them was Gavrin. Gavrin was from Brooklyn, and was only 29 when he was reported missing. On Friday, his 82-year-old nephew David Rogers, of Delray Beach, Florida, was at the burial. Rogers, whose mother was Gavrin’s sister, said Gavrin was the youngest of three children and had enlisted in 1940. He said the last time he saw his uncle was when he was 8 years old and his uncle came to visit. Rogers had injured himself, requiring stitches, and Gavrin went to his bedroom. “He awakened me and kissed me on the forehead,” Rogers recalled. Gavrin’s loss was shattering, Rogers said. When the telegram came and Gavrin’s mother, Rogers’ grandmother, opened it, “She let out a scream that lives with me to this day,” he said. But Friday's ceremony helped resolve the emotions of losing an uncle, he said. "How many people in our great, great country, have this opportunity 70 years later, to have closure?" Rogers said Friday. "Hopefully, many many more to come."